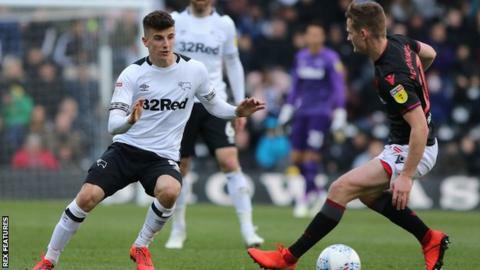 Mason Mount's hat-trick helped Derby keep their play-off hopes alive and edge troubled Bolton closer to relegation at Pride Park. Craig Bryson pounced to put Derby ahead, lashing a shot under keeper Remi Matthews while his team-mates appealed for a penalty as Harry Wilson went down. Many of Derby's better moments involved Mount and he doubled the lead on the stroke of half-time after combining with Martyn Waghorn. Tom Lawrence's cross bounced kindly for Mount to head in his second, and Ashley Cole's neat through-ball enabled the Chelsea loanee to tuck away Derby's fourth. Victory for both sides was vital for contrasting reasons, with Frank Lampard's men needing three points to stay in touch with the play-off contenders, while Wanderers looked to keep alive an outside chance of avoiding a second relegation in four seasons. Phil Parkinson set his side up to frustrate the hosts, but County gradually ramped up the pressure, with Matthews forced to save from Lawrence's volley and Richard Keogh's header moments before Derby's first-half double. Wanderers offered little resistance after falling behind and Wilson and Mount were inches away from adding to the lead before the latter made the points safe with his second-half strikes. The Trotters have the Championship's joint-leakiest defence, having conceded 72 goals this season, and the damage could have been worse here without a string of saves from Matthews. But results on the pitch are, perhaps, secondary to Bolton's off-field problems with full-time playing, coaching and non-playing staff still awaiting their March salaries while Ken Anderson's attempts to sell the club continue. They remain second-bottom and nine points from safety with four games to play, with a vastly inferior goal difference to the sides above them, while the Rams moved back within two points of the final play-off spot in eighth after Bristol City's defeat at Aston Villa. "I think he (Mason Mount) has developed here this season and there will be some testers for him. The game at Blackburn in midweek was physical, it was a test and it won't always be easy to show the attributes he did today. "He has to take the rough with the smooth, but I believe he has improved and I also believe there is a lot more to come from him. "When we had a little break in play I said to him he needs to start turning and facing people up, because people will struggle to deal with his quality, his quick feet, his awareness to play the ball around corners and that's exactly what he did. "Mason missed two months of the season and that shows he's a boy that's going to score goals and that's important for us. We haven't got the centre-forward that's scoring 25 goals, so we have to contribute from other areas." "It's been tough for us and it's horrible to get beat. "As a manager, coaching staff and players you live off results and when you get beat like we did today and compound that with the problems we are facing it's a pretty low place. "But we've got to make sure we pick ourselves up and finish the season as well as we possibly can. "Derby are a good side, they are a team that when they get in front, especially at home, and start playing with confidence they have got probably as good final-third players as anyone else in this league."